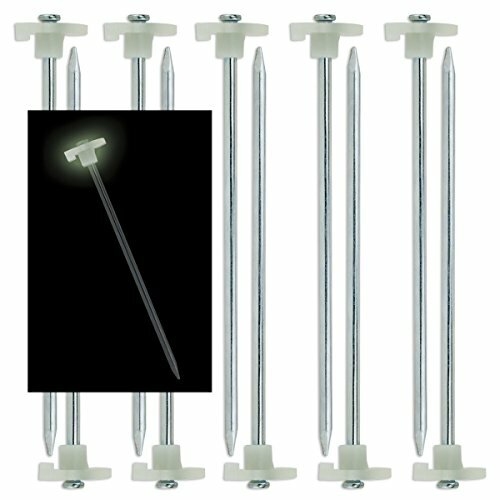 The first important thing to have in mind while choosing the tent stakes is how do you want to use them. If you want to use them for hiking, backpacking or anything that will require for you to carry the stakes, then pay attention to the lightweight options of the stakes. For the weekend trips or any longer camping adventures, consider something more solid and robust. If the tent is going to be put up for a couple of days, it needs to be held down in place, and heavier and more solid stakes will be the good choice to perform this task. Tent stakes are usually made out of steel, carbon fiber and aluminum. Carbon fiber is the lightweight option; steel is the most durable and aluminum is somewhere in between. There are even combinations of two materials, like sheathed carbon fiber with aluminum. There are even some that are made of titanium. Titanium is pretty strong, but most of the titanium stakes are thin and can be easily bent. ​Tent stakes come in various shapes and designs, every single one of them trying to tackle the problem of holding the tent to the ground in their way. Utility Stakes: These stakes are longer than hook stakes, with the way they’re designed they provide a significant holding power. They are a good choice for camping tours when you don’t mind their size and weight. V-Stakes: The name says it all; they have a V-shape design which is used so that they can be plunged into the ground easier. This design also makes them less likely to break; they have an excellent performance on the rocky or hard soil. Nail Stakes: These stakes look like large nails, they are T-shaped, where the upper part has a head like a nail, and the rest of the body is straight with a pointed end. This stakes can be easily put into the ground by hitting the top with a hammer, rock or anything you can find. Y-Stakes: This types of stakes are meant to be used in all kinds of terrain. They are a single piece nail looking stakes. The head is flat, they are pointed on end, and the body is a bit thicker than the rest types of stakes. This design makes the stakes sturdy and durable which truly is what is needed for an all-around stake. Snow Stakes: Made for a sole purpose to keep the tent in place during winter on a snowy terrain. But nothing stops you from using them in any season besides winter. They are heavy, long and curved with a hole to make them fixed in place once they are put into the ground. Great set when you need to anchor your tent in multiple places, you have twenty of them at your disposal. The heads of the stakes are quite big and pretty easy to put into the hard soil. The head of the stake is made out of PVC, and it's shaped in a way so that you can hook the rope to it. Although I don’t prefer plastic heads, these did their job just fine, the hook stays put when you wrap a tie around it, and they stay in their place during windy weather. They are heavy and sturdy, so they should be a choice for camping on a hard soil, clay and rocky terrain. This stake set is not for hiking or backpacking, they are heavy duty and made especially for that purpose. If you need stakes for light use, these will just be an unnecessary weight in your backpack. 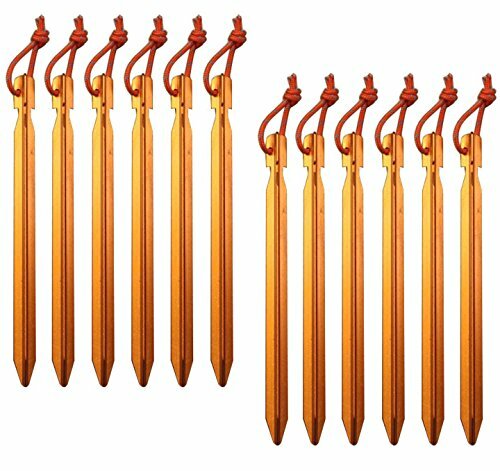 A BETTER DESIGN: All Tent Stakes are EXACTLY THE SAME, with so many overnight sellers making it a dangerous market place. A real brand is built on innovation and TNH Outdoors has designed STRONG STAKES with a RE DESIGNED head which is ENGINEERED not to BREAK. YOUR VOTE: The Outdoors is under threat from many factors and you as a consumer have THE CHOICE to vote for a low impact brand and TNH Outdoors has a strong mission to REDUCE WASTE. You are the DIFFERENCE and we encourage you to read more online or in the product description section below. HIGHLY VISIBLE - In racing red, the tri-beam ground stakes WILL NOT BE LOST in the long grass! The highly reflective paracord also ensures easy removal and visibility so you don't unnecessarily kick them around your tent at night. Ouch! 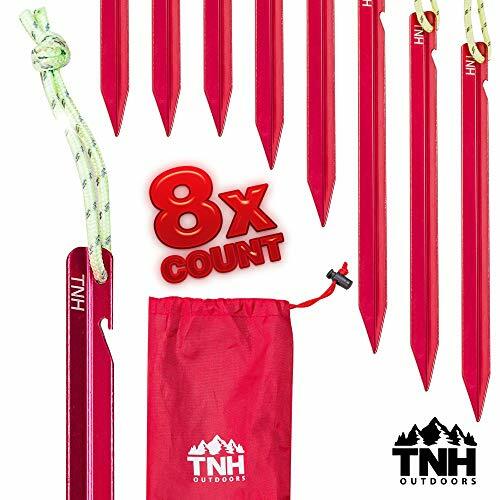 MORE STAKES IN THE KIT - With a total of eight ground stakes all packaged in their own functional pouch, this kit is ready to drop straight into your tent bag. No fuss or hassle involved, the hardest thing for you to do is find a use for those old tent pegs! GUARANTEED - The TNH brand offers THE BEST VALUE and we stand by our HIGH RATING! Better still, if for any reason you are unsatisfied, just let us know and we'll fix it. From refund to replacement, we're here to make sure you are satisfied. Because your business is the most important thing to us, we treat our customers how we would expect to be treated ourselves. These came with a bag which is a nice bonus, the stakes are V-shaped, and the color makes them easily visible in the grass. They also feature a paracord on each of the stakes that glow in the dark. All of the stakes are eco-friendly which I found quite refreshing and caring, I'm glad we're heading in that direction. The color of the stakes makes them pop out, and they are easily spotted in the grass. The price on a pack of ten stakes is pretty good that it gives them a nice value to price ratio. They are made out of aluminum, which makes them lightweight and sturdy at the same time. They are an excellent choice for hiking and backpacking, although I wouldn’t recommend their use on the hard soil. They are not that long, and aluminum will bend on a harder terrain. 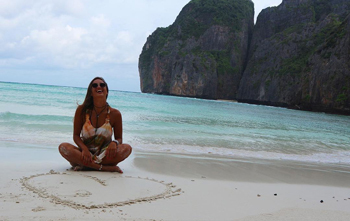 For any non-rocky surface or sand, they will do a fantastic job. 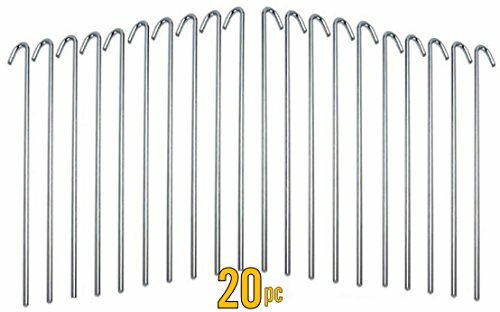 Nail-shaped, a pack of ten stakes that come with a plastic top with a hook and a hole in it. The plastic part glows in the dark, which is a great idea, I'm glad somebody thought of that. The head works in a way just like the clock hands that glow in the dark. During the day they charge while exposed to the sun, and during the night they glow with the light stored. These stakes are long and made out of metal, so the durability is ensured, and they can be safely used on a hard terrain. You can use a hammer to put them into the ground, although I wouldn't advise it unless you pay extra attention to hit the top metal part and not hit on the plastic because you can easily break it. The stoppers glow very nice, but they don't last for the entire night. Perfect for anchoring tents, garden nettings & tarps to cover and protect flowers, vegetables & Landscaping or tightly secure outdoor holiday decorations! These pegs have probably the most simple design ever, and that makes them pretty cheap too. They are made out of metal and have a galvanized finish making them rust free. They are great to use even in the garden, the tops of the stakes have a long hook that can hold even the big ropes in the garden. The length of the body of the stake makes it great for a soft grassy soil. But because of their length, you will be able to bend them with a hammer if you don't hold them in the middle. I managed to bend a couple of them even with a rubber hammer. They can make a good use in light camping and hiking due to their lightweight, but I wouldn't recommend you to use them on a hard soil. There is nothing worse than pulling out your bag of old tent pegs to find out that they are all bent and mis-shaped. With the Allonetech tri-beam ground stakes you don't have to worry about that problem! 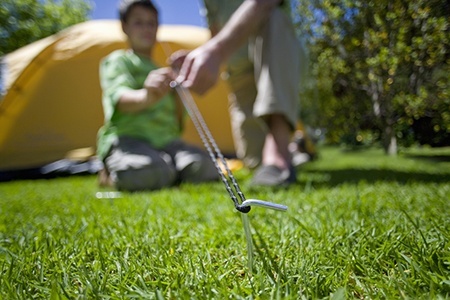 You might as well get the best and forget how to beat tent pegs back into shape! These pegs are ultra light, they are the lightest I got to try, so they are great for hiking and backpacking. The length of each stake is seven inches, not the longest ever but long enough to have a grip. The top of the stake has a hole with a cord, and the sides are cut to you can hook the string. Not the biggest hooks but should do the job with a thin cord. They are made out of aluminum making them stronger than steel, but they can be bent if you bash them with a steel hammer. If they are only a bit longer, they would have made perfect stakes for camping, but as they are shorter, they can be of great use in hiking and on the soft ground. I think I could bring fifty of these and won't notice the weight in my backpack. Overall all the five choices might be good if you carefully consider pros and cons. It mostly depends on the type of camping you will be doing. Out of my experience that I had with these few selected, I must say that TNH Outdoors Stakes were the best in overall performance. I liked the free bag that came with them, the material performed pretty well, the design made them easily put into the ground, and they are eco-friendly which I think is about time that we make that a norm.